Fremont, CA (September 13, 2010) - ASUS today announces the latest addition in its Fermi-based high-performance DirectX 11 graphics cards — the ENGTS450 DIRECTCU Series. ASUS is excited to launch their ENGT450 graphics cards featuring NVIDIA’s latest GeForce 400 GPU design that delivers impressive DX11 graphics plus support for exciting technologies like NVIDIA 3D Vision, PhysX and CUDA and enhanced tessellation. The ASUS ENGTS450 DirectCU TOP lineup goes further than reference solutions with a focus on quality, reliability and performance. These facets are driven through features like DirectCU thermal design, Voltage Tweak overvolting and reliability features like GPU Guard, EMI Shield, Fuse Protection and a Dust Proof Fan Design. These innovative features ensure enhanced cooling, frame rate, reliability and allow for superior overclocking, continuing to show ASUS’ focus at providing the best performance and value for the budget gamer who does not want to sacrifice quality or performance. Continuing to set the bar in graphics cooling designs, ASUS continues its use of its award winning DirectCU thermal heatsink and fan assembly design. 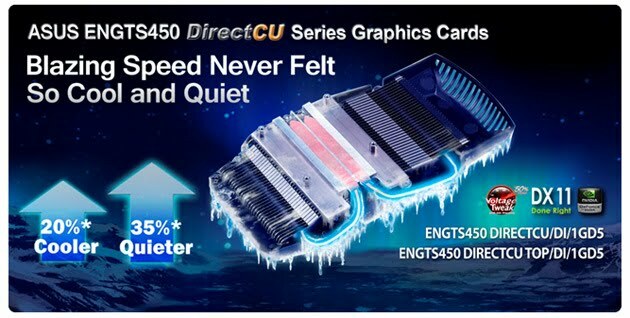 The ENGTS450 DirectCU performs 20% cooler and 35% quieter with DirectCU thermal technology as well as ensuring quiet and cool operation even when overclocked. The use of top quality components ensures that the ENGTS450 DirectCU Series stays stable during overclocking and durable for long-term use. ASUS ENGTS450 DirectCU TOP/DI/1GD5 graphics cards continue with the award winning TOP design with sorted GPUs featuring factory overclocks for improved gaming and benchmarking. The ASUS ENGTS450 DirectCU TOP series feature Voltage Tweak technology that allows adjustment of voltages to the GPU for superior overclocking and higher frame rates. Voltage Tweak in unison with the award winning fan controls offered in Smart Doctor graphics utility allow for flexibility a nd safety when overclocking. These features can boost the core and memory clocks significantly for faster overall performance* in your games, applications, or benchmarks. Dedicated gamers and media enthusiasts need look no further than the power of NVIDIA’s new GTS450 chipset in the ASUS ENGTS450 series of graphics cards. These cards open up new horizons of visual fidelity with native DirectX11 capabilities and resolutions up to 2560 x 1600. Finally, true high definition gaming comes to life in vivid detail with the added advantage of NVIDIA 3D Vision technology allowing for the most immersive gaming and cinema experience. The ASUS ENGTS450 DIRECTCU TOP/DI/1GD5 is TOP-selected and overclocked to perform at 925MHz, performing over 15% faster than reference solutions. ASUS DirectCU thermal technology: Precision mounted twin DirectCU 8mm copper heatpipes are in direct contact with the GPU — creating faster heat dissipation and achieving 20%* cooler performance and 35%* quieter operation at 21dB* (idle mode) — barely audible, even in a quiet room. ASUS Voltage Tweak technology allows the ENGTS450 DIRECTCU Series to overclock to the GPUs limits, potentially allowing frequencies near 1GHz. More impressive and more covenient, the bundled ASUS Smart Doctor utility alters the GPU voltage without requiring adjusted BIOS settings, or even reboot the PC. Gamers can achieve higher frame rates on-demand and without interrupting the on-screen action. ASUS ENGTS450 DirectCU levels up overclocking stability with the unique POSCAP (Capacitor) to reduce power noise. In addition ASUS ENGTS450 Series pushes forward in hardware design using a more advanced 4-phase power (compared to reference 3-phase) to provide higher current flow and more stable voltage during tweaking. The exclusive PCB stiffener and GPU Guard provide extra strong hold to enhance shockproof performance and prevent bending and cracking. Plus, the Fuse Protection and EMI shield deliver risk-free graphics performance. *Subject to system configuration and usage. Specifications, graphics card appearance and bundled software subject to change without notice. Please visit usa.asus.com for more details. The ASUS ENGTS450 DIRECTCU Series are available immediately from authorized ASUS resellers. With an MSRP starting at $139.99, ASUS’ 400 series extends the spectrum of features, performance, and true Windows 7 optimization to new audiences. ASUS, the world’s top 3 consumer notebook vendor and the maker of the world’s best selling and most award winning motherboards, is a leading enterprise in the new digital era. ASUS designs and manufactures products that perfectly meet the needs of today's digital home, office and person, with a broad portfolio that includes motherboards, graphics cards, displays, desktop PCs, notebooks, netbooks, servers, multimedia, wireless solutions, networking devices and mobile phones. Driven by innovation and committed to quality, ASUS won 3,268 awards in 2009, and is widely credited with revolutionizing the PC industry with the Eee PC™. With a global staff of more than ten thousand people and a world-class R&D team of 3,000 engineers, the company's revenue for 2009 was US$7.5 billion.